Well, what a crazy busy couple of weeks. I haven’t had time to sit down and write another post to my blog and I’m now a week behind. But that is what happens at this time of year, even in this quiet little corner of the globe. The events and festivities plus trying to finish up work and projects before the end of the year. In my business, real estate, there is always a bit of a rush to try and get a last minute closing or contract executed before the law firms close down for the holidays. Here in the Bahamas, most law firms, real estate companies, insurance offices, etc. will be closed for the full week next week. In the Bahamas we celebrate Boxing Day which is Commonwealth nations concept that didn’t make it into American culture. The origins of which are a little hazy, but basically it is another bank holiday right after Christmas so everyone can either recover their heads or start to work off the excesses of Christmas day. In Nassau it is a big day at the Rugby Field with the annual very well attended ‘7-asides’ tournament. Traditionally though, in the Bahamas, Boxing Day is a day to visit family and relatives and check on that aunt or cousin you haven’t seen since last year. Family is generally considered to be very important here. 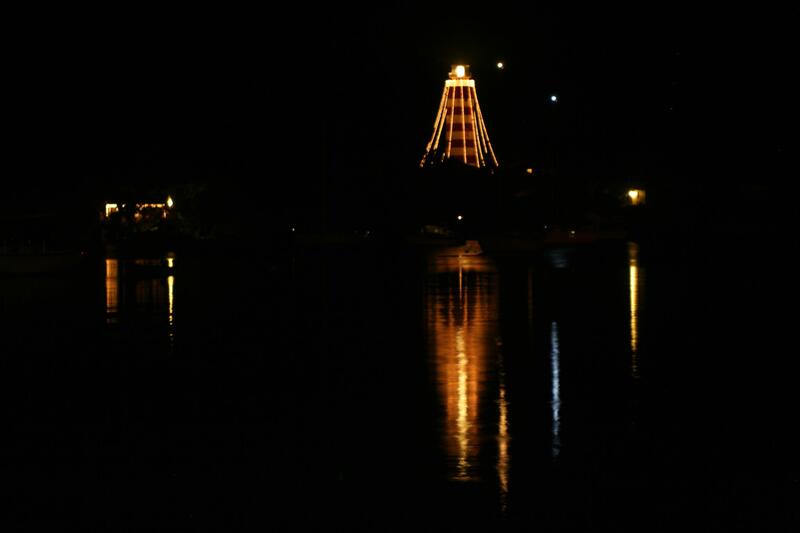 As always, every year, Hope Town decorates and lights up their iconic lighthouse. It is a beautiful sight to see when commuting the harbour or just sitting at the Harbour’s Edge for a nice meal. The photo below is courtesy of Olivia Patterson, thank you Olivia. Recent events in Abaco for me include the company Christmas Lunch, held at Fire Fly resort on Elbow Cay. The restaurant there is spectacular and everyone enjoyed their meal. The setting is wonderful for sipping their unique cocktails while watching the lazy island sun set. Other recent happenings include the Abaco Christmas Festival which is a great slice of local flavour and Bahamians come from all over Abaco to enjoy the festive atmosphere and get a bite of some scruptous Bahamian food. I made sure to get a cracked crawfish with conch’n’rice and baked mac’n’cheese on the side. Delicious. My Rotary club had a booth once again and raised some much needed funds for our projects, while also ‘ringing the bell’ to raise money to supply food parcels to the less fortunate at this time of year. The club usually provides over 200 boxes of food to various families across the island to make sure they have full bellies at Christmas time. The tourist season is in full force with many of the rental homes being booked up for the Christmas and New Year period. It is practically impossible to find a golf cart for rent on the cays. There is something special about Christmas in the islands, we don’t have a white snowy Christmas but there is still the spirit in the air. Looks like it might be cold enough this year to wear that rarely used sweater, which is nice. Generally the business news in the country, while not all good, it has been constant which means that there is activity and the economy is improving despite the hiccups. The real estate market is getting better and 2013, I think, will be the year of ‘buyer’s regret’. In closing I wish you all a healthy happy end to 2012 and a joyful, impressive 2013. And remember happiness and wealth start within – think it, will it, do it. Happy Christmas and Joyful New Year.